George Barna and his Barna Group are some of the most trusted names in market research for Christian ministries, non-profit organizations, and various media and financial corporations. While in 1984 the company was originally founded as a simple research company, in 2004 the company regeared its focus to research and facilitating transformation based on that research. 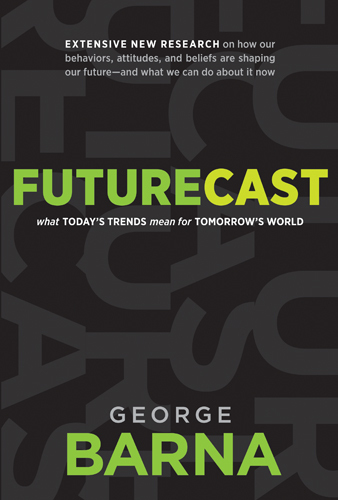 Futurecast is a collection of the most recent data on the Christian demographic in the nation coupled with Barna’s predictions for the next 5 years based on that data as well as transformative suggestions on how to act on that data. One of the biggest changes those familiar with Barna’s early years will notice is the steer away from trying to initiate social change from the top down (government, business, education, etc), to focusing on how we can impact individuals for the kingdom in our sphere of influence. Personally, I think that should be obvious, but I know many Christians, and I’m sure you do too, who would rather take on the government in all its abstract bureaucracy than tell their neighbor about Jesus. But as Barna points out, individuals make up society. Reaching one person who reaches one person who reaches one person who reaches one person is an exponential catalyst for social change. If I had to pick one thing to critique, it’s Barna’s championing of the home church movement as something new and separate. While I wholeheartedly support the home church movement in the U.S., I don’t think it needs to separate from the legacy church and form its own denomination like Barna implies. While he doesn’t push it too strongly in this book, I just finished another book that Barna coauthored entitled Small is Big where that idea is presented pretty forcefully (Click here to read my review of Small is Big). However this critique is at best a side-note to Futurecast and doesn’t detract from the book at all. Overall, the numbers Barna presents in his book about U.S. culture and Christianity are not overly shocking, though there are a few surprises in there. If you’re at all interested in where our nation stands in terms of its Christian culture, then I recommend Futurecast whole heartedly. Thanks to Tyndale Publishing for sending me a free copy in return for my honest opinion. Great review, sounds like a good book, thanks for sharing. Interesting! I'll have to pick this one up. Thanks!